Remove the string and rind from the ham. 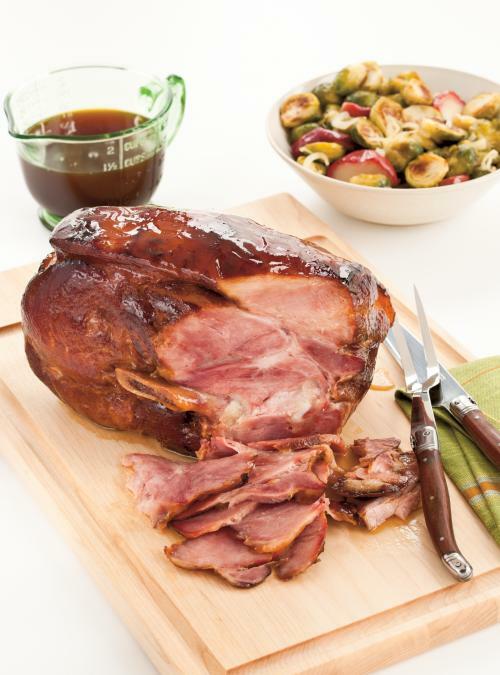 Place the ham in a large pan or Dutch oven and cover with cold water. Bring to a boil and simmer over medium heat for 15 minutes. Remove the ham from the pan. Discard the water. Start over again. Drain. Set the ham aside on a plate. In the same pan or Dutch oven, bring the syrup to a boil. Simmer until it thickens and begins to caramelize. Add the remaining ingredients and bring to boil. Place the ham in the pan. Season with pepper. Cover and bake for 2 hours. Uncover and continue cooking for 1 hour, basting frequently with the cooking juices. 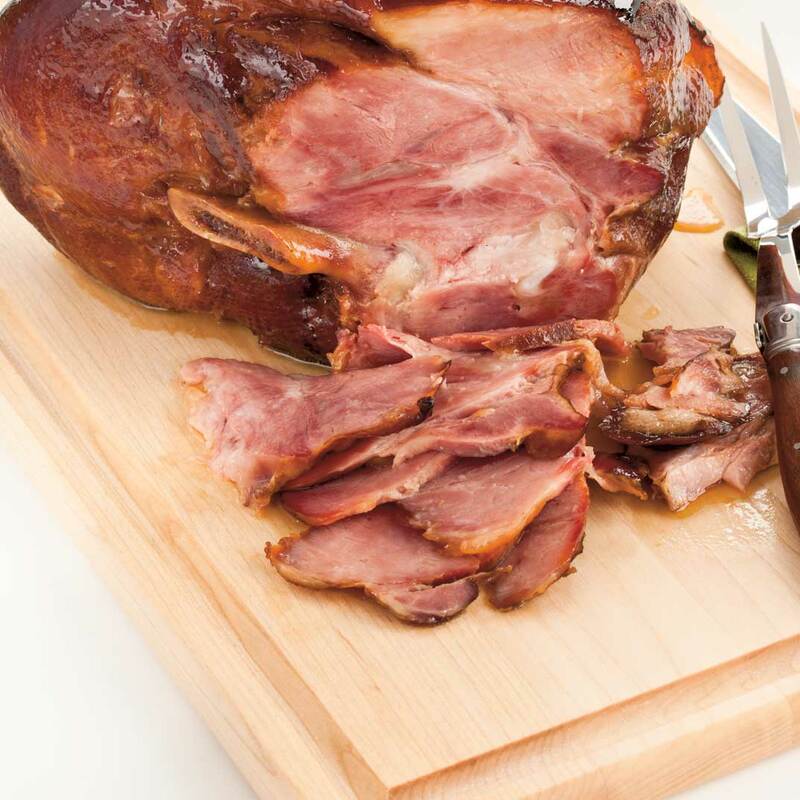 Place the ham on a carving board and reduce the cooking juices by half. Wonderful! Would any changes need to be made to use a bone in ham vs a pork shoulder? This is is a good ham! After reading all the other comments about not being able to reduce the maple syrup, however, I decided to skip that part, and I put the ham, maple syrup, cider, and pepper directly into the oven. It turned out just fine and sped up the cooking time considerably. As Ed H. mentioned above, I also used somewhat less liquid than was called for in the recipe, and this worked very well. I will also put a few cloves in the ham the next time I make this. Apart from the saltiness, it was excellent. I did spend 20 minutes twice simmering the ham, and yet I found it a touch too salty. Maybe leftovers will taste less salty or with mash potatoes that are under salted? My sister in law made it and it was excellent, so I know what to expect. Totally delicious - your company will be impressed! Made this several times; always delicious. I agree with other commenters on reducing the maple syrup; it takes a LONG time and doesn't really caramelize, just gets slightly thicker. Also, in general I find this recipe uses about double the liquid that is needed. I recommend using HALF of all liquids; same result, less waste at the end. Last time I made this I used juice instead of cider; worked just as well and saved myself $10. i'd like to have more info on hopw to caramelize the maple syrup. Absolutely amazing. I put the slow cooker on high for 6 hours. What we didn't eat we froze and it was awesome even a few days later. Keep a lot of sauce. Delicious! Could not reduce the sauce to a thicker consistency though.